I spent the past 2.5 years of my life studying eastern white pine trees. Pinus strobus trees, for those who are curious. During that time, I chewed on a lot of pine needles. Why? – because when I’m in the woods, I like to sample. Because I like to see how things taste. Because I love to eat. Some things have become favorites, such as wintergreen leaves. Others, such as maple twigs, I’ve learned to ignore, because they taste like, you guessed it, twigs. And now that I’ve finished my research project, it’s only natural that I…. pine for those good ole days. I’ve been seeing so many good popsicle recipes lately, it’s made me wild-eyed with desire to make my own. Since rhubarb is a big hit at my house, it made for a clear choice when pondering what flavor of ice pops to kick off summer with. But where I’m going with all this is that I decided to spice my pops up with none other than white pine needles. Simple syrups are made for water-based ice pops such as these. For this recipe, I steeped a hefty amount of white pine needles in the syrup for an hour. For identification purposes, eastern white pine is a 5-needle pine, meaning that there are 5 needles per ‘bundle’ on the twig. You can use this year’s needles if they have already grown to their full length; up here in northern Maine, they’re still small, and the new growth is still very sticky. As such, I used last year’s needles – the next whorl of needles back. Make sure to wash them well and remove any sneaky insects. Try to avoid needles from roadside trees where pesticides or heavy salt may have been applied. At top: this year’s foliage on white pine begins to grow. At bottom: A mature white pine [plus a shadow that indicates I’m the proud owner of the world’s longest pants] captured wonkily through a fisheye. Identify this tree by the feathery appearance of its foliage. If you don’t live in the east, southeast, or midwest of the U.S. (or somewhere in our forgotten neighbor to the north), you’re out of luck for finding eastern white pine. But you, unlucky one, can take the following advice I’m about to offer despite not having any factual basis for doing so. Find the ‘strobus‘ located in your region, and hopefully its genetic similarity will allow it to flavor simple syrup in the same way. You could also use spruce needles. Or, you know, you could just leave it out of the recipe. Everything will still taste prrrrrretty much the same, to the non-discerning palate. By the way, those flavorless maple twigs? They work perfectly as substitute popsicle sticks. In a small saucepan, make a simple syrup by combining the water and sugar, and heating until the sugar has dissolved. Turn the heat off, add the white pine needles, and let steep for at least one hour. Remove and discard needles when finished steeping. Meanwhile, remove rhubarb ends. Chop roughly into pieces, and place in a large saucepan. Add enough water to cover the rhubarb, and a generous pinch of cinnamon. Cook over medium high heat for 15 to 25 minutes, until the rhubarb has broken down and formed a near-homogenous mixture. Using a strainer, separate the rhubarb mixture (a greenish color) from its juice (pink). Save the juice. In a pourable container (such as a juice pitcher), combine rhubarb mixture with simple syrup. Add in reserved rhubarb juice – which is very bitter – bit by bit, tasting frequently to reach desired sweetness level. When level is reached (I still had a decent amount of juice remaining), pour into 3 oz. paper cups or popsicle molds. If using cups, set in a shallow pan, and cover tightly with plastic wrap. Insert twigs or popsicle sticks into the center of each cup, pushing down to secure. Freeze for at least six hours, preferably overnight. We enjoyed these as the finale to a Midsummer Feast last Wednesday night. For the feast, we made some homemade aquavit, and served dill potato and smoked salmon salad, quick pickled cucumbers, and salmon encrusted with coriander, fennel and dill seeds. Goodbye, Midsummer. Hello, winter….. in a few short months! 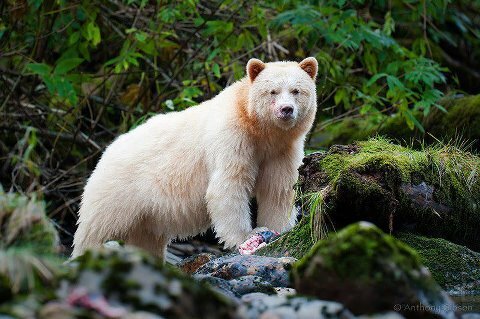 The Kermode bear, also known as a “Spirit Bear” is a subspecies of the American Black Bear living in the central and north coast of British Columbia, Canada. 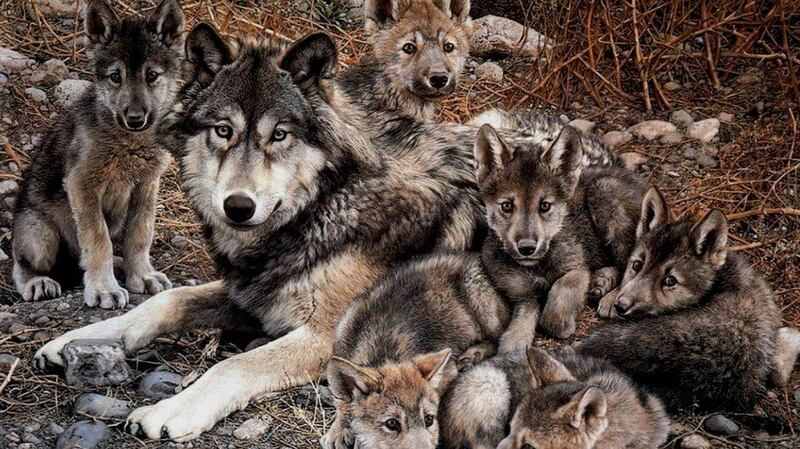 It is noted for about 1/10 of their population having white or cream-coloured coats. This colour morph is due to a recessive allele common in the population. They are not albinos and not any more related to polar bears or the “blonde” brown bears of Alaska’s “ABC Islands” than other members of their species.